Our services often impact a variety of your most favorite living spaces. We always provide quality service with a focus on your comfort and aesthetic needs. A great theater experience is as important to us as it is to you. 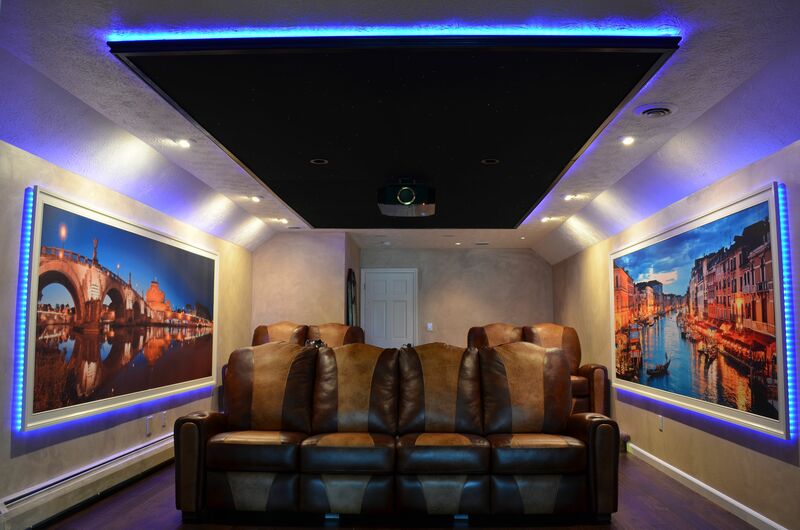 Whether you need a fun family space, a party/entertainment area or a dedicated home theater, we can provide a perfect solution for you! Regardless if it is behind a 60" LED TV or in an A/V rack, all devices and wires are managed to give you the most clean and professional installation desired. 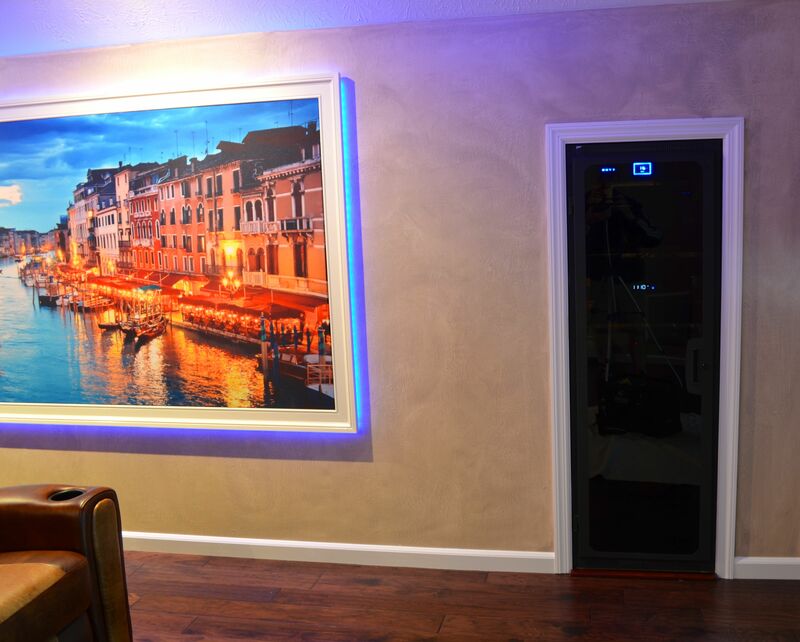 Talk to us about adding LED accent lighting to your decor today! Show Off Your Rack !! We love showing off our racks. If you have an installation done by another company and it doesn't look like this, call us we can help. Large or small, we can provide a rack solution for all types of areas. This project started out as very basic, poorly thought out media room that another dealer in the Pittsburgh area had installed in the summer of 2011. The home owners were not completely satisfied with the picture and sound of the room but thought “it was good enough” since they had no reference to what a good system should look and sound like. That is until they walked into our showroom and got a taste of a properly engineered room! A plan was formulated and construction was started in early 2012. Our goal was to improve both the sound and picture as well as the functionally of the room. We wanted to create a space that would be a destination in the home that would serve both movie watching as well as a gaming center for the children in the house. An Italian “Tuscan” theme was chosen for the style of the room, and we started gathering pictures and ideas that would serve as a blueprint for the finished project you see here. The room was reconfigured with a motorized screen that would allow us to take advantage of the length of the room and give us seating for at least eight. 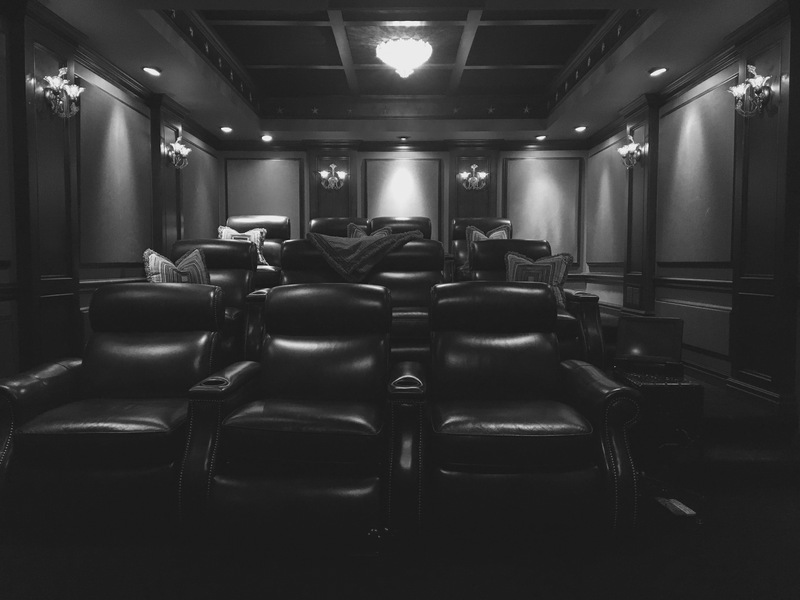 Two risers were built in the rear of the room to accommodate twin custom theater chairs on each. The first row of seating will accommodate 4 people with individual reclining chairs and foot rests in a large single couch. 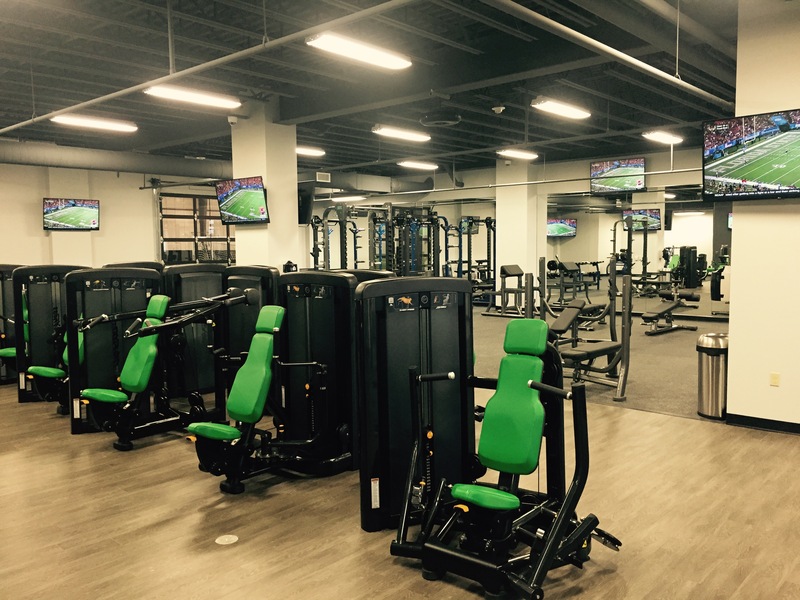 All of the seating was done in custom two tone leather provided by United Leather Seating. The equipment was relocated in a rack with a tinted Plexiglas door, flush mounted in a crawl space to the left of the screen, to free up valuable floor space. 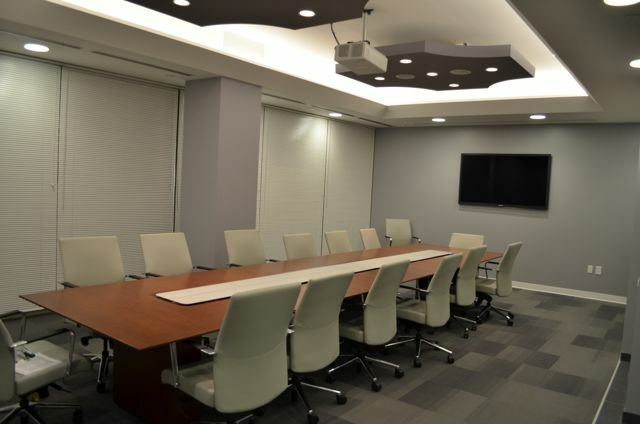 The lighting was reconfigured, and recessed lights were added to highlight the wall panels and cabinets as well as add additional task lighting in the room. We installed several cabinets to store popcorn supplies, candy and extra game controllers. The cabinets were hand glazed by our staff to age them and match the room theme. A granite countertop was also installed by a local supplier. Perhaps the most striking feature of the room is the ceiling and wall panels. Both are constructed of acoustical sound control material which allowed us to use a hardwood floor in the theatre and still have excellent acoustics. 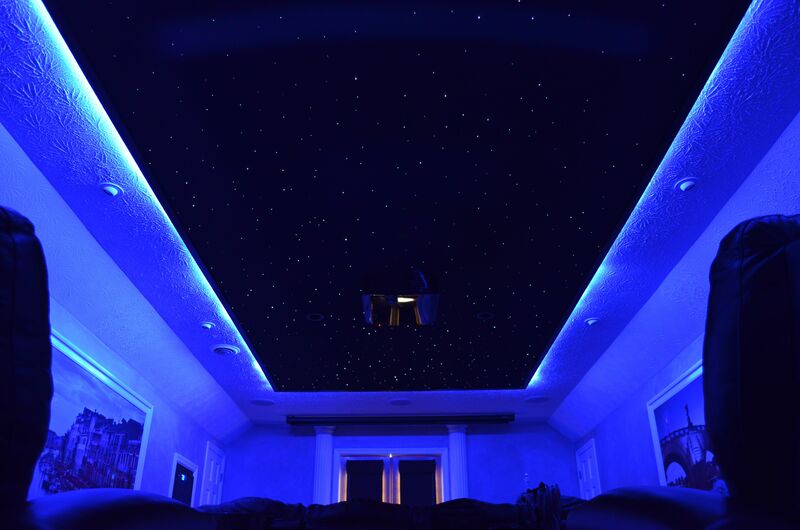 The ceiling is highlighted with a fiber optic star field, and a perimeter LED halo lit trim package that gave us a sky for our star ceiling. The wall panels were custom built using a process that allowed us to “print” a photorealistic image on a special acoustically transparent fabric. 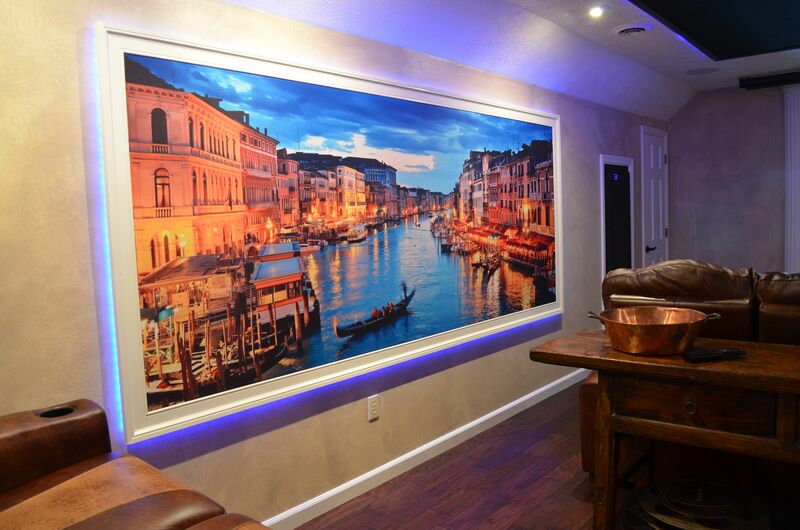 Ultra high resolution photos of Venice & Rome Italy landscapes, both shot at dusk, were used on the 4’x10’ acoustical wall panels. 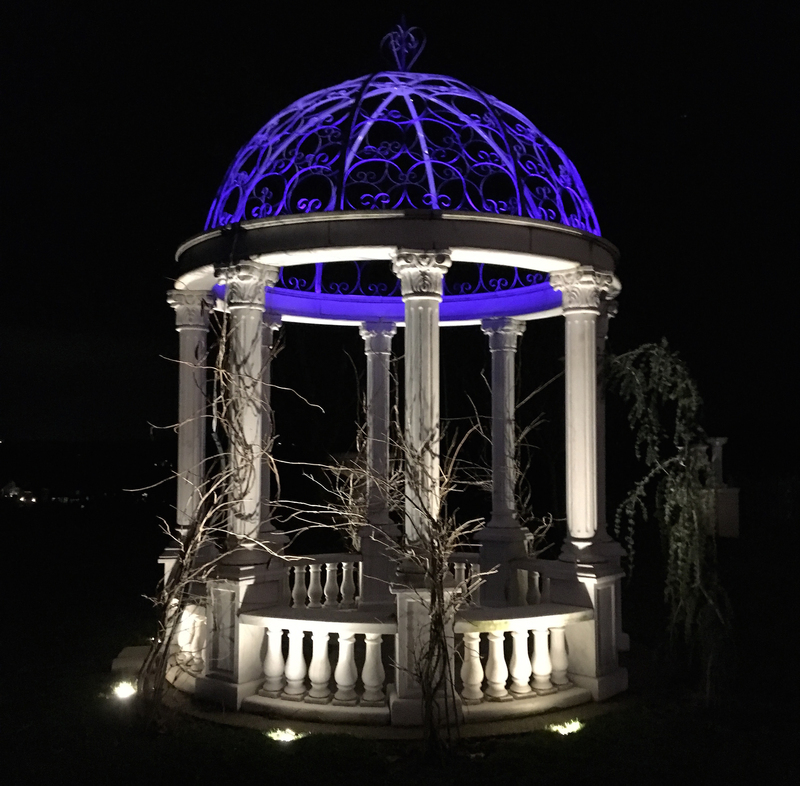 The panels were trimmed to look like a window looking out into a majestic landscape and both were halo lit with the same LED lighting used on the ceiling. The effect is stunning in person. The entire system is controller with a Control4 HC800. This allows complete control of the sound system, as well as the motorized screen and 8 zone lighting system. The star field, LED halo lighting and all of the task lighting can be dimmed and used in several “scenes” depending on the use of the room at the time. The homeowners as well as their children are extremely please with the outcome of the system and have since starting having us upgrade other parts of the house. This project was created, bid, designed, and installed in a two week timeline. We were given a short window to have the majority of the work completed before an "open house" tour that they were giving. 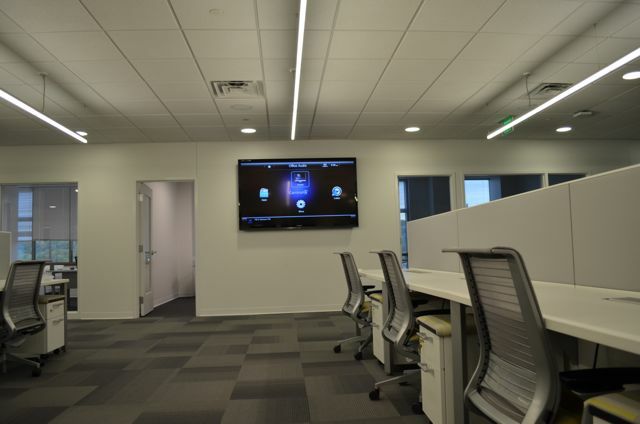 The project consisted of a large distributed audio system, , fully automated Conference Room, and a Video Distribution System. We also installed a HD Video Conference System and several IP Surveillance cameras throughout the office. Most of the work was completed after hours so we did not disrupt the day to day operations. The audio system consists of more than 30 audio zones that include over 80 high-fidelity speakers installed in the ceiling. Each zone has a separate volume control for balancing the audio throughout the common areas and audio control in each office space. The entire system is controlled with a Control4 Processor and powered by Crown Amplification . A system was designed to carry several cable boxes, 2 apple TV’s and a Mac Mini to 8 common area large screen LED HDTV’s. All of the monitors including several 80” TV’s were connected to an HDMI Matrix to share the sources which will include company information displayed through the Mac Mini to each of the monitors. 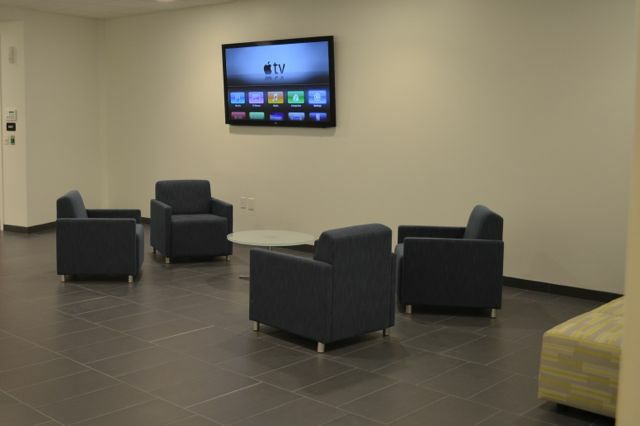 There were also additional monitors installed in each of the executive offices connected to independent cable boxes and Apple TV’s. All of the video is automated through several Control4 processors and controlled with either Control4 remotes or through an app on a desktop computer. This office has an impressive conference room with floor to ceiling glass walls framing two of the four walls. As beautiful as it is to look at, the giant pains of glass can wreck havoc on any kind of video presentation. A group of motorized blinds were installed to deal with all of the light coming in the windows on sunny days and to allow the 120” motorized screen and Panasonic projector to produce quality, larger than life images. We also installed a 65” Samsung LED TV to be used when more light is needed or for use with the Video Teleconference system. Several speakers were installed in the ceiling and powered by a Denon Receiver. An Apple TV and cable box are among the other available video sources in the room. A simple table top keypad commands the projector, lighting,blinds and source selection. This allows anyone the ability to control the system without a lesson on how to turn things on or operate the system. The entire room is automated with a Control4 HC800 Processor and can be controlled at the keypad or through an app running in a computer. A Sony HD video Conference was chosen to connect this office to remote locations for true to life, face to face meetings. The motorized HD cameras located in several offices allow for pan, tilt, and zoom as well as presets that will point the camera to either the conference table or the white board at the back of the room while doing presentations. An office this size demands a certain level of security. Employees can be found at their desks at all hours of the day and night and the entrances are controlled with card access points and monitored with high resolution ip cameras which are intergraded into the control4 system. They can be seen at any of the TV’s or at several Key Computer monitor throughout the office. 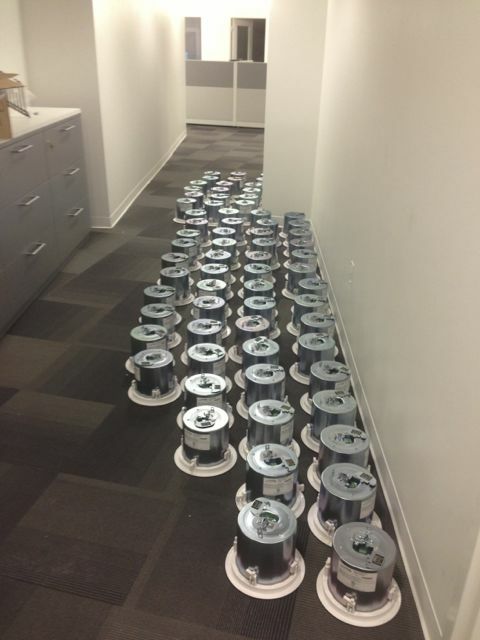 Each camera records the coming and going of the office with a time stamp on each of the recordings.